Aquarius September 2016 Horoscope promises that this is an excellent month for Aquarius born people. It is the ideal time to purge all detrimental things which are obstructing your life both physically or emotionally. By end of the month, you will be full of prosperity. Majority of the planets for the Water Bearers are in the upper half of the chart towards the mid heaven sign and the career planet is forging ahead. Career issues will be important, and domestic and emotional aspects will remain in the background. Success in business will be instrumental in enhancing happiness in the family. The 2016 numerology predictions also suggest that this is not the time for independence or aggression for the Aquarius zodiac sign. You have to depend on your friends and family for achieving your targets in life. You should be flexible and bend yourself to situations rather than forcing any issue. The Aquarius 2016 September monthly zodiac forecasts that change of job is likely for the employed due to the influence of the lunar eclipse. Businessmen employing people may face trouble and will have to make organizational changes. Aquarius, planetary patterns are not favorable for your finances and will test your patience in September 2016. All major investments and large expenses should be done at a later date. Your earnings are reasonable this month and will improve after the 28th with the movement of Jupiter to Libra. There will be clarity on monetary issues after the first week of 2016 September. Necessary modifications will be required in your financial thinking and strategies. Your spouse will have to make necessary corrections to monetary strategies. Single Aquarians looking for love relationships will be successful towards the end of Mercury Retrograde. Love is more passionate and your sexual compatibility will be high during the month. Learn to express yourself to your partner and children. Relations with your ex-boyfriend or ex-girlfriend will improve. This is good month to resolve difference of opinions in relationships. There might be news of birth of a child in the family. The Aquarius forecasts for September 2016 suggest that health will be troublesome till the third week. It will get better after that. Use home remedies to cure minor ailments and learn to relax with meditation and alternative therapies. 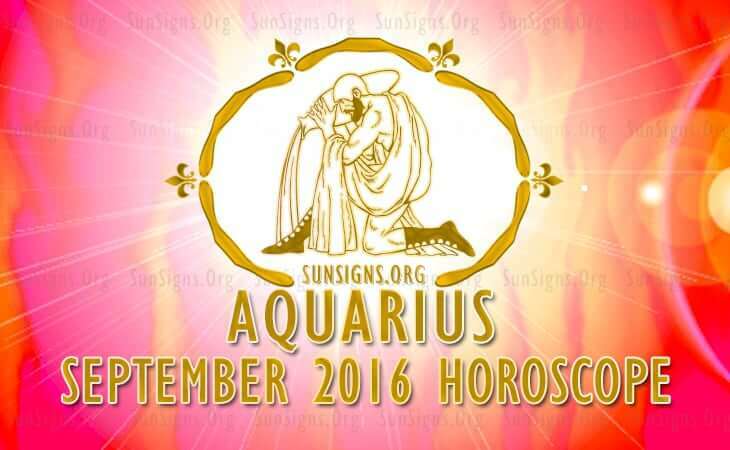 To conclude, the Aquarius August 2016 horoscope foretells that this is a month of good fortune and financial returns.